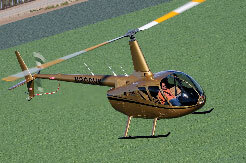 The new Robinson R66 Turbine helicopter retains many of the design features of the R44, including a two-bladed rotor system, T-bar cyclic, and an open interior cabin configuration. 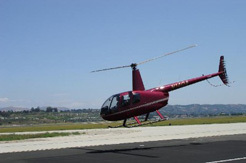 Notable differences are the R66's increased reserve power (Rolls Royce RR300 turbine engine), improved altitude performance (14,000 ft max operating ceiling), fifth seat, and large roomy baggage compartment. Popular upgrades including HID landing lights, leather seats, and a stereo audio control panel are standard in the R66. For pilots who expect superiority and understand value, the R.44's design and brilliant performance make it an idyllic choice for private and business use. 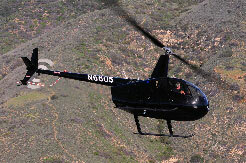 The R44 delivers the performance of a turbine helicopter at a reasonable price. Its sleek design, speed and supreme dependability give it the competitive edge in today's market. Hydraulic power controls and balanced pistol cyclic controls are designed for more comfort and smoother transition. Automatic clutch engagement simplifies the start up procedure. Advanced warning devices include low fuel warning main gearbox temperature and chip lights, tail gearbox chip light, low oil pressure light, engine fire light low voltage alternator light, low RPM warning light and horn plus rotor brake and starter engaged warning lights. 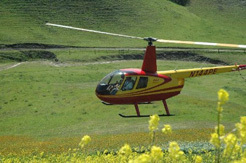 The rotor brake reduces shutdown time and risk. 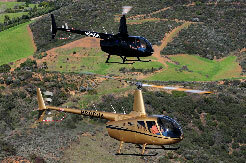 Robinson uses Lycoming engines for long life and reliability. Maintenance between 100 hours only require oil changes keeping maintenance costs low. Time between overhaul is 2200 hours or 12 years. Primary controls are actuated by maintenance-free bellcranks and push-pull tubes. 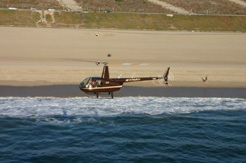 Rotor blades are stainless steel with a thick leading edges to minimize erosion. 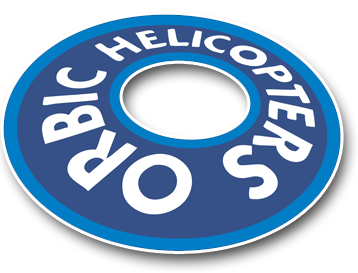 Call Orbic Helicopters at 805-389-1070 for more information!